Calculator Desktop, Dual Power Calculator Solar For College - 12 Unit Case by BAZIC-PRODUCTS at Ledina. MPN: E7-B3C7-E12D. Hurry! Limited time offer. Offer valid only while supplies last. 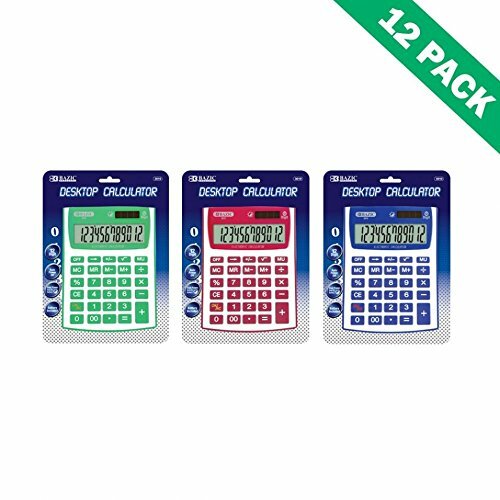 Multi-pack - desktop office calculator comes in a case of 12 units. Variety - 12-digit calculator case comes with green, red, and blue calculators. Dual powered - solar calculator desktop also uses battery power. Energy-saving - solar desktop calculator turns off automatically to conserve power. Calculator dual powered weight: 3.5 lbs; dual power calculator dimensions: 14.5" x 6.5" x 6.5"